Lava Lamps, by Pedro de Elizalde. Click here for more of the artist’s work! She rubbed her wrist, eyes wide as she found her once fair skin now a crimson color. Aireae looked up from her hand, her gaze meeting that of the foot tall blue imp sitting on a rock halfway across the cave. He turned away shyly after a moment in her sight. Memfit watched her mutter an oath and brush a tear off a cheek before she looked around the cavern. 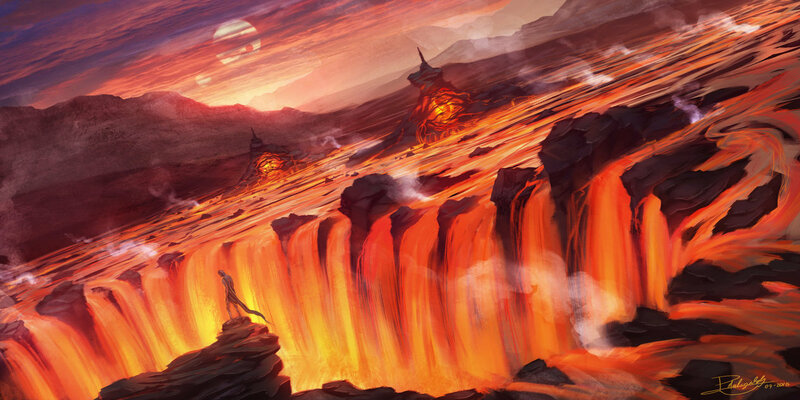 The red hued light that filled the chamber drew her eyes to the cave’s mouth not far away, and Aireae gasped on sulfurous air seeing the flaming sky and lake of lava outside. The wavering heat would have boiled Aireae’s human flesh, but to her red skin it was a pleasant breeze. She took a step towards the opening to see more of the landscape, then tripped, discovering her stride was no longer as it was. “Careful, Mistress!” Memfit shouted as his spaded tail shot to attention. Aireae yelped and stumbled, stepping not on the feet she was accustomed to but on cloven hooves at the end of a digitigrade legs. She fell to the cave floor as bat-like wings unfurled from her back and softened the fall instinctively with a flap. “Wings?” She flapped them again, feeling their leathery caress of the air and a beckoning promise of flight. The haze over Aireae’s consciousness continued to abate. Rising to her knees on the rock floor, she confirmed her nakedness with a downward glance. Then Memfit’s cough drew her attention to the blue hand he offered. Aireae grasped it, and somehow it fit around her own as he helped her to stand on unsteady legs. Then she stared dumbfounded at the formerly tiny imp that was now half a head taller than she was. She watched him stop just outside, then followed with careful, cloven steps. She rubbed her behind and wrinkled her brow studying the rocky ledge. Finding a smooth spot beside him, her wings faired out as she lowered herself to sit. She leaned forward, squinting as he tried to wiggle away. Aireae drew in a breath as her fingers left him. Aireae leaned back. Taking a deep breath she looked up into the fiery colors of the sulfurous sky above. She heard the sound of her spaded tail slapping the cliff side, and her eyes narrowed seeing yet another appendage she’d have to get used to. He shut-up as Aireae glared at him. Listening to the slap of her tail, his own prehensile appendage began to swish in time to her beat, back and forth like a nervous metronome. With a mumbled incantation, Memfit’s finger scratched a vertical line of eldritch energy in the air between them. Reaching into the tiny tear breaching an elemental plane of existence, he pulled it slightly wider and glistening mercury poured from the aperture. The silvery metal splashed and formed a small puddle on the rocky outcropping they sat on. “There! Take a look!” he said gesturing to the mercury’s reflective surface with one hand while closing the rift like a zipper with the other. Aireae leaned over as prompted, and Memfit watched her stare at the puddle. Moments passed as her dark pupils and fingers glided over features both devilish and humanly familiar on her face. He gulped as she looked up from the liquid mirror and met his gaze. Her black lips, a perfect match to her original’s in all but color, smiled. “Oh, a l-long time,” he said stuttering as her tail crossed his. So creative, Jason, and great characters. Nice job flipping the sold-your-soul trope. Fabulous!! So much character, and such an amazing story. Glad you wrote it. I seriously loved it. Thank you, Cathleen. :-) I’m proud of this one, and put a lot of effort into polishing that hook. I’m glad you enjoyed it!